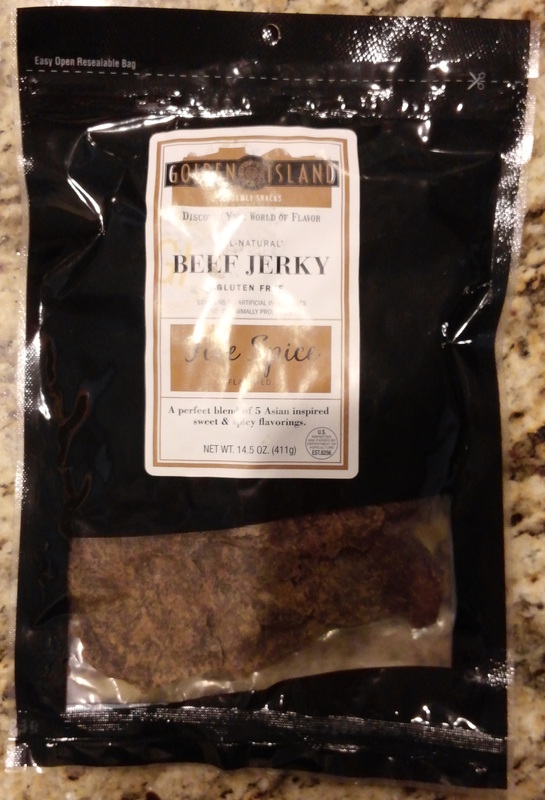 Today’s object of interest is a big ol’ bag of Golden Island All-Natural Five Spice Beef Jerky from the jerky selection at the local Costco. Taste (B+): This is a tasty jerky. The flavor is predominantly a sweet one with a nice “Asian” flair. You’ll notice a well-balance saltiness and the familiar notes of soy sauce that add breadth to this jerky’s taste. There’s a tiny bit of spice in there too, though difficult to make out on its own, that adds some character overall without drawing any real attention to itself. The mix is, taken all together, a great one. Piece to piece it is pleasant and appetizing. Texture (B): In general, this jerky is a moderately tender and slightly moist jerky. The meat is cut along the grain, at a bit of an angle, and has a ragged and tattered surface. It tears easily and is nicely chewable… if you take a bite without any gristle. Smell (C+): The scent of this jerky is okay, but not particularly remarkable. It has a surprisingly weak aroma considering the strength of its flavor and making out anything specific from what you can smell is a challenge. This isn’t bad by any stretch, but it doesn’t add much to the overall experience. So while the generally nondescript scent doesn’t offer anything of note it doesn’t offend in any way. Appearance (B+): This jerky looks pretty good once you get used to it. The pieces are medium to largish in size, though there are a fun number of crumbs to be found. They are a dark brown color with a ragged surface that looks at first like a coating of seasonings but with some scrutiny turns out to be tattered bits of the meat itself. It’s a very distinctive look. Consistency (C-): While it is clear that a great deal of attention went into crafting an enjoyable and high-quality treat, this particular jerky has some consistency challenges. First, there is an exceptional amount of gristle in the bag. More than just bits of fat here and there – something you’d generally expect, particularly in higher quality jerkies made with minimal processing – this jerky had dozens of pieces that you just couldn’t eat. After the fist few unsuccessful bites you end up eyeing the next piece with suspicion and end up trying to visual week out the disagreeable bits by hand. It’s more than a bit distracting. The pieces themselves are cut thickly and are generally substantial, but again not reliably so. A sizable portion of the bag has pieces 2-3 times as thick as the norm and their moisture content varies from dry-but-tender to nearly-desiccated and ‘old’ feeling. The flavoring too suffers from lackluster execution. While the majority of the bag delivers the sweet and tasty five spice flavor well, it’s a slight majority. Easily a third of the jerky in the bag had either a very weak flavor or a flavor that seemed out of balance with the norm. Overall this inconsistency of the meat itself, its thickness and moisture, and flavor really take a toll on the appeal of this jerky. Overall Impression (C+): This is so nearly a great jerky. The flavor is good and the meat enjoyable, but with the significant inconsistencies in the jerky itself the quality suffers greatly and it really diminishes its appeal. The folks at Golden Island have the makings of something great, but for now at least it’s merely “okay”. If you’re willing to wade though the tough bits and can overlook the variability of execution from piece to piece, it really is a tasty jerky and there’s still something there to enjoy. Be brave and try a bag – maybe you’ll have better luck than we did. Eat well! Tagged artisan, beef, gourmet, sweet, Texas Gourmet. Bookmark the permalink.